Why are there protests in Poland? Here are the five things you need to know. Poland is gripped by its most severe constitutional crisis since the Communist regime declared martial law in 1981, with protesters — both inside parliament and outside in the freezing streets — accusing the ruling party of threatening democracy. Law and Justice (PiS), the party in power, has roots in the dissident trade union Solidarity, which helped bring down the Communist regime. But it has this in common with the authoritarian Communist PZPR, which ruled Poland between 1948 and 1989: It occupies an absolute majority of seats in the Sejm, the lower house of the Polish Parliament. Unlike the PZPR, it was elected in free and fair elections. Here’s what you need to know about the protests and what they say about PiS’s rule in Poland. 1. What happened Friday night that set off the protests? Since 8 p.m. on Dec. 16, major protests have been held around the Sejm and Senat, the Polish parliament, after the ruling party excluded an opposition MP from parliamentary proceedings. Here’s the background. PiS had announced that it will ban the news media from the Sejm building, beginning in January, with the exception of specially accredited journalists. Objecting that this was an infringement on the freedom of the press, journalists gathered in front of the Sejm on Thursday afternoon. 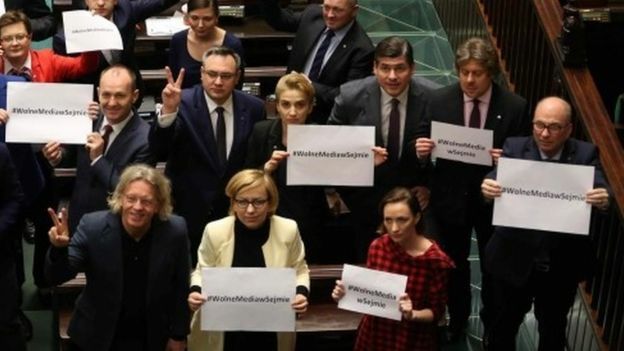 The opposition MP in question, Michal Szczerba of Civic Platform (PO), showed up to speak at the lectern with a note that read, “Free media in the Sejm.” He placed the note in front of him so that it would be visible in the TV broadcast. The speaker of the house then dismissed Szczerba from the parliamentary proceedings. A larger group of opposition MPs from several parties blocked the lectern. The speaker promptly concluded the proceedings, and moved them to a smaller location in the Sejm out of view of the news media. There, a subset of parliamentarians, overwhelmingly from PiS, voted on one of the most important bills of the year: the budget. The vote was irregular in several ways. There is no record that a quorum was present, because the room to which the speaker moved the proceedings is not equipped for recording electronic roll calls. Without a quorum, the vote is unconstitutional. Moreover, instead of following parliamentary rules and voting on each amendment in turn, all amendments were rolled into one agenda item and hastily passed in one vote. Finally, no roll call was taken — a custom followed in the Polish parliament since 1993. 2. This latest move is one of a series of PiS’s controversial decisions since it overwhelmingly won the 2015 elections. These events are typical of the PiS government. Shortly after coming to power, the government did not recognize Constitutional Tribunal justices approved in the previous Sejm term. Instead, PiS nominated its own justices and limited the court’s constitutional review powers in ways that the European Union criticized. PiS has also moved to take over the state news media, targeted state employees it considered unloyal and politicized local governments. 3. Civic society has mobilized dramatically in response. After the decisions regarding the court, protests spanned the entire country. Some protesters created the Committee for Defense of Democracy, a grass-roots organization, unaffiliated with any of the opposition parties. Its acronym (KOD) was designed to be reminiscent of KOR, the Workers’ Defense Committee, created in the 1970s to protest the Communist Party’s treatment of workers in Poland. KOD’s leader Mateusz Kijowski is not affiliated with any political party and the movement has currently a network of branches at home and abroad, including in the United States. 4. A single party now controls the executive and legislative branches, for the first time in Polish post-communist history. Given Poland’s proportional electoral system, it is very difficult for any political party to lead a cabinet on its own, without any coalition partners. In the government before this one, the PO had to govern in a coalition with PSL, which was quite unlike it ideologically. In Poland’s parliamentary system, as in many others, the prime minister’s party is only “checked” by members of its junior coalition partner. This is different from the U.S. and other presidential systems. In a parliamentary system, the same party serves as both the executive and the legislative branch. If the coalition is cohesive and parties are disciplined, the cabinet can use the legislature to extend its powers. If successful at this maneuver, all bills proposed by the cabinet will be passed by the legislature; no bills that the ruling majority didn’t want would ever be placed on the legislative agenda. So why didn’t previous Polish governments abuse this majoritarian advantage? Because none of PiS’s predecessors had the opportunity to rule as the sole governing party, unchecked by a coalition partner. Nor were previous ruling parties as cohesive and disciplined as PiS. 5. The PiS government is not going anywhere for now, but its authority has been undermined. We do not expect the protests to dislodge PiS from power, any more than previous demonstrations have. However, the budget was approved in unclear circumstances. Even commentators from the same ideological camp worry that this may lower financial ratings and increase investor anxiety, hurting Poland’s economy. Thousands have taken to the streets to protest the party’s announced policies and the surprise moves against the media and the courts. Despite its autocratic behavior and the intense opposition and criticism it provoked, the party has remained cohesive, and committed to its program. Anna Grzymala-Busse is the Kevin and Michelle Douglas professor in the Department of Political Science at Stanford University. Monika Nalepa is associate professor in the Department of Political Science at the University of Chicago.